The new Street Chronicle was published today. Angelo Anderson at the NEOCH Annual Meeting in March decided that the Board and the vendors should write something about Brian Davis for the new paper. So the paper has many stories about the long time editor of the Homeless Grapevine/Street Chronicle. I actually started as a volunteer with the paper before I had a job at NEOCH. For one year, I edited the paper and delivered it to vendors when the agency was unsure of its future. The only thing we were doing in late 1994 was publishing the newspaper and selling it to vendors for 10 cents each. We had many vendors until Mayor White sent his police out to harass our vendors. We sued the City and spent the next three years in court. This hurt our vendors and we also saw a noticeable decrease in the pedestrian population. Nearly every vendor wrote stories about their interactions with me. 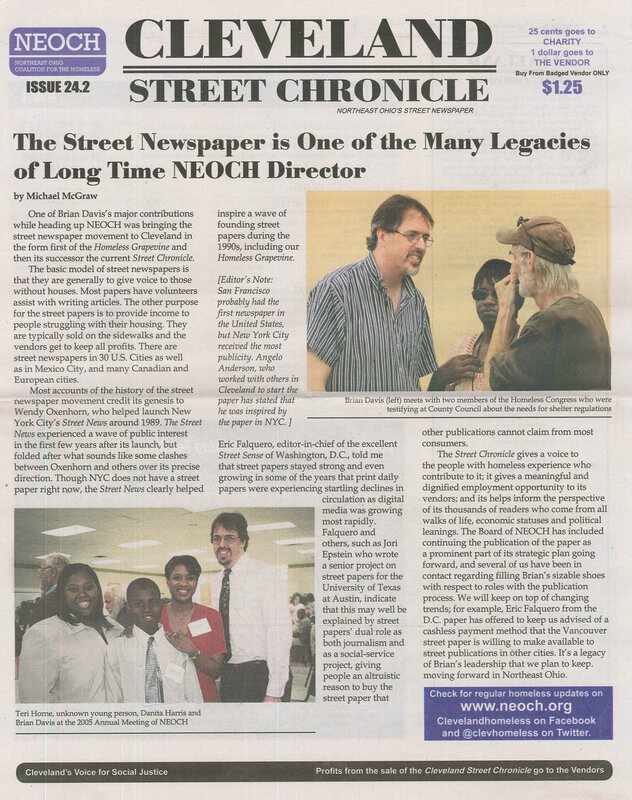 Staff also wrote articles and a number of former staff sent in remembrances to NEOCH. Two long time board members put down a few words and we featured a story about Michael Stoops that I wrote. If I annoyed you over the years, you might want to skip buying the paper. It will be overwhelming to those who were not big fans of my advocacy and they will want to use the paper as the lining of a cat's litter box. County Office of Homeless Services staff, Mayor Michael White, and many of the homeless service provider will want to avoid purchasing the paper at the West Side Market or downtown. There are no refunds for those who have exploited, antagonized or harmed homeless people and were criticized by me. The paper is sold by vendors and they keep all the profits, but they certainly do not give refunds to all the foundation staff who hated that I criticized other charitable organizations. Sorry, but that is the way the vendors make their money and all sales are final!